The characters in Roman mythology have played a role in human society for over 2,000 years. Unable to explain through science the events that occurred in the world around them, ancient Romans developed a complex mythology that assigned human emotions and natural events to god and goddesses believed to be responsible for them. 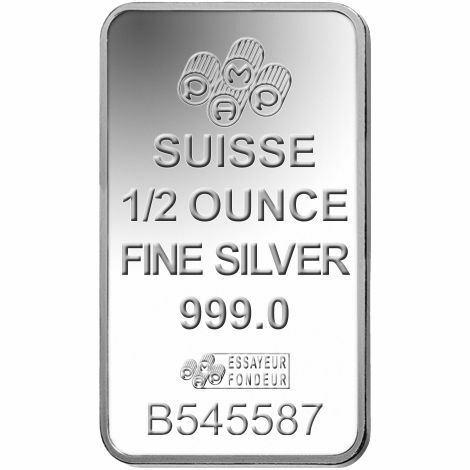 One of the most popular silver bars today are the Fortuna silver bars from PAMP Suisse. Now, you can own a new 2.5 Gram PAMP Suisse Fortuna Silver Bar from Silver.com. 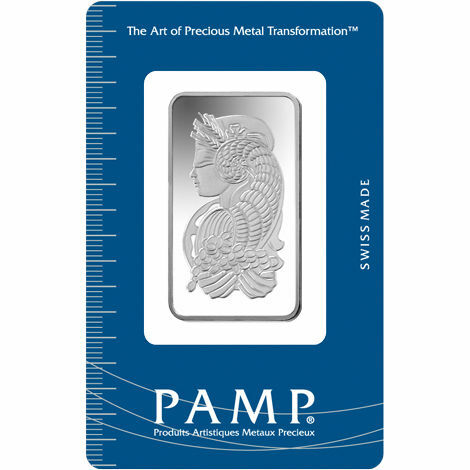 These bars are brand new, minted in 99.9% pure silver and come sealed in their PAMP assay card. In Roman mythology, Fortuna was the goddess of fortune. It was said that she could bring both good luck and bad to those who worshiped her. She also had a role in Roman religion, serving as the personification of luck. Her father was the Roman king of the gods, Jupiter. He was perhaps better known by his name in Greek mythology: Zeus. 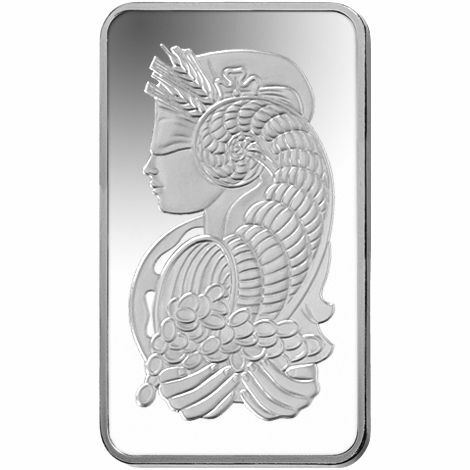 On the front face of the 2.5 Gram PAMP Suisse Fortuna Silver Bar is the depiction of the goddess herself. Fortuna is featured in a left-profile portrait, with a blindfold over her eyes and a cornucopia attached to her head. The horn of the cornucopia cascades down her side, ending at her cupped hands. Flowing forth form the cornucopia is a wealth of coins. The opposite side of the Fortuna silver bar bears all of the identifying markers of the bullion product. 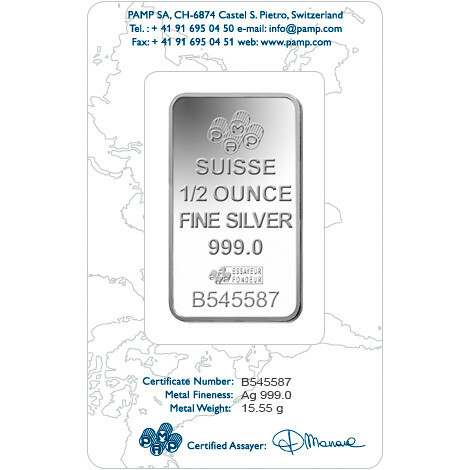 Engravings, from top to bottom, include the corporate name and logo of PAMP Suisse, the weight, metal content, purity, and serial number of the bar, as well as the assayer’s mark. PAMP Suisse, known in French as Produits Artistiques Metaux Precieux, is an independent refinery that was founded in Ticino, Switzerland in 1977. Today, PAMP is part of the larger MKS Group. The Geneva-based MKS Group is a global precious metal and financial services firm that is one of the largest in the world. 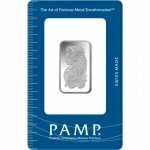 The state-of-the-art refinery and fabrication facility at PAMP is considered one of the world’s finest, and has established the brand as the most respected in the precious metals marketplace. 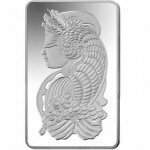 If you have any questions about this Fortuna silver bar, other Silver.com products, or the online purchasing process, don’t hesitate to contact our associates at 888-989-7223. If you need further assistance, our representatives can also be reached online through the live chat feature which is located on our contact page.